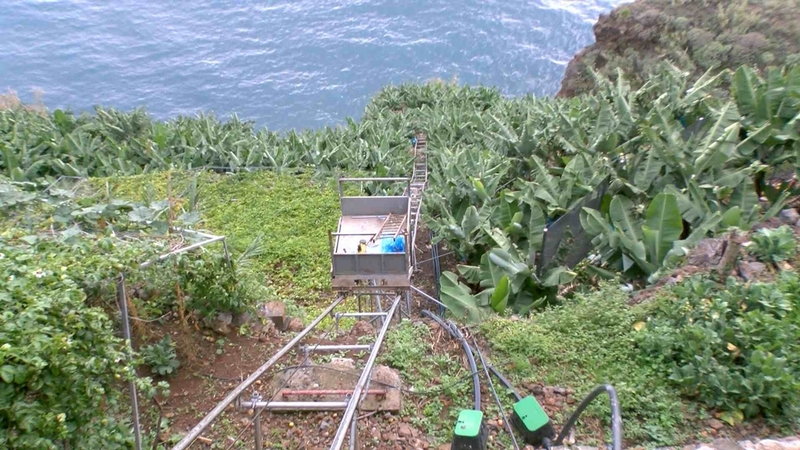 Investment funding to help modernise a banana plantation located on the steep coastal slopes of Madeira. The investment e balde the beneficiary to produce high quality food more competitively. Portugals' Madeira island is an important producer of fruit and vegetables and its Atlantic location allows its farmers to grow a range of tropical fruits that are exported to mainland EU countries. Bananas are one of the island’s main crops and the productivity of banana plantations continues to be improved through support from Madeira's regional RDP. The aim of this RDP project was to help modernise a banana plantation in order to improve its overall competitiveness. The plantation is located on steep slopes at the cliff edge of Madeira’s coast. Improved access to the crops and better irrigation facilities were required to boost the long-term business potential and overall financial viability of the plantation. RDP funds were used to cover the costs of a new lift to bring the bananas up the slopes to the farm’s central processing point. Improvements were made to broaden an access road for a new vehicle that was needed to transport the crop to a nearby packaging plant. In addition a new ‘intelligent irrigation’ system was part-funded by the project. Outcomes of this modernisation project have improved the ability of the beneficiary to produce high quality food more competitively. This helps to safeguard rural jobs and support the island’s agri-economy. Environmental benefits result from the new irrigation system, which makes use of gravity (rather than fossil fuels) to power its operations. In addition, the irrigation system can be carefully controlled in order to reduce risks of water wastage. Modernisation of EU agri-businesses helps to safeguard the supply of a wide range of different types of high quality food products for EU citizens. Use of environmentally-friendly technology in modernisation projects produces further benefits for EU citizens. In this example the bananas are also sold through a producer group, which provides food for a short supply-chain and adopts regional branding to reinforce quality standards and promote customer loyalty. Jardim do Mar, Madeira, Portugal.